ເຄາະຮ້າຍ ກໍຍັງມີເດັກນ້ອຍຄົນນຶ່ງ ແລະ ເດັກທາ ລົກສອງຄົນ. 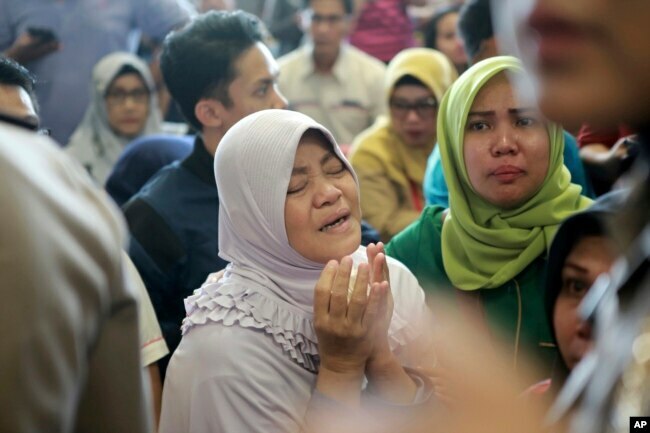 Search and rescue crews Tuesday continued the grim task of recovering the bodies of the 189 passengers and crew believed to have perished when their Lion Air jetliner crashed into the sea minutes after taking off from Jakarta early Monday morning. Officials said late Monday night that 24 body bags with human remains have been taken to a hospital for identification. Several hundreds of pieces of items have also been recovered from the crash site, including books, wallets, cellphones,bags and parts of the aircraft fuselage. Among the victims were one child and two babies. About 40 divers are involved in the search for the wreckage of Lion Air Flight JT610, which vanished from radar screens 13 minutes after take off on a flight to the capital of the Bangka-Belitung tin mining region. The plane is believed to be about 30 to 35 meters deep in the waters of the Java Sea. Authorities say the pilots requested to return to the airport shortly before the crash. The accident is the first reported that involves a Boeing 737 MAX 8, an updated, widely-sold aircraft that is more fuel-efficient. Lion Air chief Edward Sirait told reporters the aircraft suffered a technical problem during a flight from the resort island of Bali to Jakarta the night before, but was resolved according to procedure. The plane had only been in service for two months. Monday’s crash is another black mark on Indonesia’s fast-growing aviation sector, which has acquired a reputation for poor safety oversight. The country’s airlines have previously been banned from operating in the United States and European Union.